With advancing technology, we are continually finding more effective and thorough ways to do dental treatments. 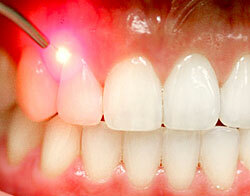 One of the newer advances is the use of laser therapy to treat periodontal disease (gum disease). How does it treats gum disease? Periodontal disease is caused by the collection of plaque, tartar, bacteria, and food debris along the gum line, which then results in the loss of gum tissue, supporting bone, periodontal ligaments, and ultimately, the teeth themselves. Lasers are useful in killing the bacteria that has accumulated and has caused gum inflammation, infection, and recession. It gets to the root of the problem at the microscopic level. The focused light from the laser eliminates bacterial colonies that are otherwise impossible to attack. It also curettes (disposes of) currently diseased gum tissue and provides a positive healing surrounding for the gums themselves. Laser therapy is a safe innovation that allows you to have healthier gums by providing a more detailed and successful deep cleaning. Before laser therapy treatment is performed, the area to be treated will be numbed for your comfort. The accuracy of the laser helps to remove bacteria and diseased gums with precision and care. The laser also dulls the gums and minimizes bleeding, swelling, and discomfort! After the numbness wears away, you are good to eat whatever you want!